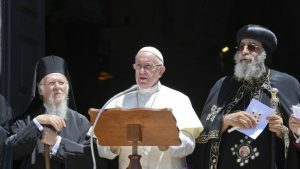 In a cause dear to all the faithful – and in particular to Franciscan friars to whose the care of the sacred sites of the Holy Land have been entrusted – Pope Francis gathered Christian leaders in Bari on 7 July to pray for peace in the Middle East. The Mother of God sustains us as we journey together. Here in Bari she is venerated as Hodegetria: the one who shows us the way. Here lie the relics of Saint Nicholas, the Oriental Bishop whose veneration crosses seas and bridges boundaries between Churches. May Nicholas, the wonder-worker, intercede to heal the wounds that so many people bear within them. Here, as we contemplate the horizon and the sea, we feel drawn to live this day with minds and hearts turned towards the Middle East, the crossroads of civilizations and the cradle of the great monotheistic religions. Let there be peace! This is the cry of all those who are Abel today, a cry that rises up to God’s throne. For their sake, we have no right, in the Middle East or anywhere else in the world, to say, “Am I my brother’s keeper?” (Gen 4:9). Indifference kills, and we desire to lift up our voices in opposition to this murderous indifference. We want to give a voice to those who have none, to those who can only wipe away their tears. For the Middle East today is weeping, suffering and silent as others trample upon those lands in search of power or riches. On behalf of the little ones, the simple ones, the wounded, and all those at whose side God stands, let us beg, “Let there be peace!” May the “God of all consolation” (2 Cor 1:3), who heals the broken-hearted and binds up every wound (cf. Ps 147:3), hear our prayer.